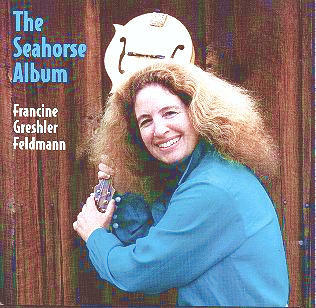 The Seahorse Album samples the songs and tunes of composer / singer Francine Greshler Feldmann with a 15 - title collection composed by Francine and recorded with a variety of musical friends. That's Love, I'm Still Here, We Don't Belong, We Meet In Shadows, My Souvenir, I'm Always A Cowgirl At Heart, and Meet Me In The Moonlight, along with selections from two of Francine's "musical fantasies": The Secret Of The Webbing Purple - This World's A Beauty 'Cause Of Me, and I Think You Should Have It. Helena Grapevine - Queen Of The Night, Love In The Key Of Blue, You're My Only Friend, Iguanas Are Not Roses, and Helena Grapevine (the title song). To hear samples from this album, click on the highlighted songs in the listing on the left.